Single gentlemans warranted all pure Irish linen handkerchief white with a subtle decorated corded stripe border and a narrow hem, made in Ireland. Single gentlemans warranted all pure Irish linen handkerchief white with a subtle decorated corded stripe border and a narrow hem, made in Ireland. 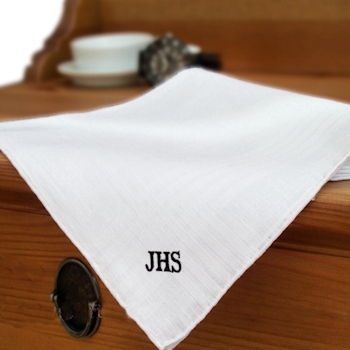 This 42cm luxury linen handkerchief can be embroidered with monogrammed initials, a name or nickname of your choice. Every man should have their own fine handkerchief. Just fill in the option box and choose what colour embroidery you would like us to use and the lettering style you prefer. Choose the option and upgrade to a Gift Set of 3 Irish linen handkerchiefs for a discounted price. A fine gift of pure Irish linen made completely unique with monogrammed embroidery.